Your car is one of the biggest personal investments you will ever make in your life. As such, you will want to retain its quality and retail value. For the engine and the other moving parts, regular car maintenance is the key to ensuring everything runs smoothly for a long time. However, for the outward appearance of your vehicle, nothing provides protection against the elements better than paint protection film. Make sure you get high quality car paint protection in Dubai from DITEC, the leading automobile detailing services provider in the city and the UAE. Weather conditions in the UAE can reach extremes throughout the course of a year. During the hottest months of the year, temperatures in Dubai can soar up to 50 degrees Celsius. In addition, vehicles in the country get tested by the high level of humidity in the atmosphere during summer. DITEC Dubai combines tested and proven techniques with the latest paint shielding technologies in order to develop solutions that withstand the severest conditions. With our surface protection solutions, your car will be prepared to face the effects of weathering and the possibility of abrasions from various debris on the road. In addition, our film shielding technologies protect the paint of your vehicle from the harsh UV rays, allowing the paint to age naturally and preventing the onset of discoloration. Aside from protecting your vehicle, our film technology also helps enhance its appearance by giving it a high-gloss finish that looks good in any weather. So whether the sun is up or the heavy clouds have started to give way to rain, your car will look good and be protected at all times. 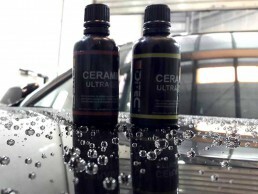 finally, you do not have to worry about any residual effects of removing the shield from the surface of your vehicle. If you want to take it off your vehicle, it comes off without damaging the paint job on your car.